To decide which app is suitable for note taking it’s necessary to first classify notes and then decide which app fits best. Here are some examples of notes typically taken on mobile devices. For all time-critical short notes it’s recommended to use the built-in Apple apps Reminders and Calendar as all the information is pushed across all of your devices if iCloud syncing is activated. These apps use the screen-keyboard of your device and are not suitable for creating larger notes. Most of the other apps used for note taking don’t support an alert functionality like Reminders or Calendar. So the only way is to use Apple’s built-in apps by creating a reminder which refers to a time-critical event in another app. For more text oriented notes like todo lists Apple’s iWork for iOS components are recommended because they are also synced across the devices, can be sent by E-Mail and converted into the PDF format for annotating in a collaboration environment. For brainstorming and content which has to be structured while creating it or later a mind mapping app like iThoughts (Craig Scott, UK) will be the best choice. I myself use a mind mapping app even during meetings and review and rework it afterwards. For notes which have to be encrypted use 1Password, a password keeping app. This app provides a category called ‘Secure Notes’ where you can add text. The app provides strong encryption and syncing via iCloud as well as Dropbox. It took me a long time to find out apps which meet most of the above mentioned requirements. No app could really convince me. The research ended on a sour note. The biggest disappointment came up after reading an article on ipadcurriculum about the app TAPOSE. I purchased it because the author and other sources praised it as the best note taking app ever seen. 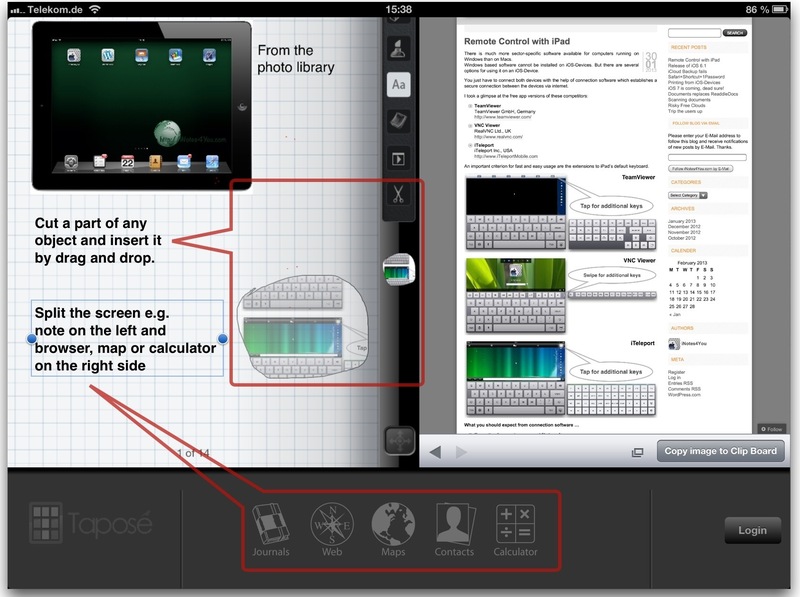 I saw really exciting features and from my point of view an awesome approach to note taking. But you should not look at the details. The only thing I can do is to cheer the developer up to fix all the critical points. Anyway here is a screenshot which shows some of the really good ideas. So the only app still remaining in my pool is NOTABILITY. The app is available only for the iPad. For further details see the description on Apple App Store: Notability. One star dropped away because of the the missing connection between Web Clips and the link to the selected site, a further star for missing access to maps. The app has a nearly perfect design following Apple’s iOS Human Interface Guidelines. Most of the icons are self-explaining and I only looked into the user guide to find out which app specific gestures are implemented. No star dropped away but, needless to say, every future improvements are welcome. I always have to look upon the interoperability of an app with Apple’s iWork suite. I create many documents with Numbers, Pages and Keynote and though it’s a MUST to use this content in other apps too. See this gallery to get an impression of the UI and some objects from other apps which were inserted into a note. Every iWork document can be transferred to Notability using the ‘Open in Another App’ command within iWork and selecting the PDF format. Slides of Keynote can be directly transferred using the clipboard. One star dropped away because the file formats of Apple’s iWork suite are not supported. Inserting a so-called ‘Web Clip’ does not save the related web address. So it’s just a screenshot of the website. I contacted the developer and here is the answer. Thanks for following up with us. Are you asking about the web clip feature in Notability? If so, hyperlinks are not currently supported in Notability. Web clips can be used to capture information on a web page and insert and image of it into a note. It will not link you back to the site. We see how having hyperlinks would be helpful to our users and will explore this idea for a future release. Let us know if you have any other questions. Have a great weekend! Access to maps is not supported. Access to clouds only for export not for import of documents. See this video on YouTube introducing a simple solution for a note taking tool which is not designed for business use. If you use a note taking app you should buy a pen. I cannot give any recommendation because I don’t really see the benefits of pens compared to a real pen and a sheet of paper. With this old-fashioned configuration the only action for controlling the ‘device’ is to change the paper and strike out some pointless stuff. The battery for all this is my heart and until today it works well with no gradual failure. The only disadvantage I see is that the brain still cannot connect to the internet. Look here for an overview of pens. Keep in mind that touchscreens are friendly to your fingers but using a pen may result in a sulky mood when the first scratches come out of the woodwork. See Katie’s experiences with her first pen. I hope you stay in touch with iNotes4You. If not please comment what you didn’t like and I will do my very best to improve my presentation.